The best kept secret in High End? Italian firms have a long history in the high end industry. Mainly because when they create something it not only performs very well for the price, but it also looks stunning. Usually that means a higher price tag, we all know that nothing in high end comes for free. This time though we deal with a company that even though it does not consider themselves to be (price and aesthetics wise) a High End company, they make products (or at least the MP 11 that I am reviewing now) that definitely belong into that upper class of products that “are” music by themselves! The MP 11 is a big enough, for the power it delivers, power amplifier that uses a half width, but full depth and height, chassis, so that when you put a pair side by side they take as much square footage as a normal powerful amplifier. They are not very heavy but most of their weight comes from the weight of the thick brushed aluminum front, the single 300VA transformer and the big enough (for the power) heatsink that is inside the amplifier chassis. The front is very clean as it only includes a power on / stand by push button and a small white LED that lights up when the amp is on. The master power button is found inthe rear of the amp, as a single good quality RCA input and two pairs of speaker out connectors that accept spades, bananas and naked wire of considerable thickness. In the rear we find also the IEC power receptacle that includes the fuse. The chassis is made out of iron folded sheet, which I prefer more than the usual (high end) aluminum panels as far as EMI/RFI rejection is concerned, even though it is more difficult to dampen. The chassis sits on four small feet that do offer some anti-vibration action, although I would advise to set the amps on a special platform or use special feet (like the amazing Aktyna that I reviewed a few weeks ago) since it performs way better on these special devices. On the inside the first thing we notice is the big enough (for the output power of the amp) toroid transformer (300VA) that delivers its power through many paralled power diodes that make the bridge rectifier that converts the AC into useful DC and then the 40.000 uF/63V capacitor bank, that resides close enough to the power transistors. These are three pairs of MosFETs (Hitachi K413 & J118) which are mounted on a big enough heatshink that resides in the middle of the chassis. The input stage is based on a big vertically positioned board and uses only discrete devices and, as you can read in the short interview at the end of the review, without any capacitors on the signal path. Right behind the thick aluminum front we find another board that carries all the protection circuit (and power stand by) so that the amp is fully protected by overcurrent, overvoltage or pretty much every difficult situation that can face in case of a failure so that our speakers are totally protected. The amp draws in stand by around 2 watts of power and when it is delivering a few watts in a benign load (as my speakers) it draws about 25-30 watts. As eco-friendly as any analogue amp there as can be! Listening and getting very excited! The pair of MP 11s replaced my class-D amp (based on the TI TPA3251 chip). The preamp in this system is based on a Nelson Pass single ended, pure class-A circuit with a naked Vishay shunt potentiometer, my source, for this test, was only digital (Über-PC with Audiophile Optimizer, Fidelizer Pro, MusiCHI Suite in core mode, Ideon Audio 3R Master Time, Ideon Audio Ayazi MkII SE) and the speakers were, as in the last 5 years, my design, The Sublime (soft dome Scanspeak D3004/662000 tweeter, Audio Technology custom 9” woofer, 90dB/w/m, 6 Ohm –from 180Hz-20kHz impedance). The cables are all my design (speaker, interconnects, USB), there is a DC-filter from the wall AC receptacle (again my design) and then comes the very effective AC power filter from Lab12 (Gordian), that is powered by its own cable, Knack. There was also a Lab12 Knack power cable for the pre amp, and as far the two power amps I used identical Abbey Road power cables (these were actually the only identical power cables that I have in my arsenal). The Aktyna feet were used in pretty much all the devices, except the power amps platform (my own design) that uses a complete set of dual Rollerblocks with tungsten balls (I use that combination for every power amp I test). The room that I use for listening has 0,3-0,6 sec due to the extensive use of Zainea ESR Acoustics Roundffusor1 diffusers, lots of LP shelves, Synergistic Research ECTs and Acoustic System Resonators, all placed in strategic places around the room. By the way if you use the amps without some care on the vibration department you will not be able to squeeze every ounce of the incredible sound quality they are capable of, I warned you! The sound of my system is usually relaxed but very precise, open and airy but a bit dark (that is how I like it) with a very spacious, holographic soundstage that starts from some space in front of the speakers and extends as far as the recording allows. The tonality, due to my power amp is pretty similar (in the midrange) to a really good 300B SE circuit (yes there are some bad ones too out there), but with better, cleaner and warmer high frequencies and also way better defined and controlled bass. The sound with the MP 11s in place got a little less spaced out but much denser, the bass got even more control, definition and kick/punch, maybe with a little shorter decay (but that maybe because of the better initial kick), the midrange lost some of its 300B harmonic magic but got more defined in space, so much denser and with so much more presence that jazz, pop, rock and all kinds of vocals got so much more fun and exciting to listen that I was floored! Yes they project images a little more upfront than my amps, but I think my amps are a little laid back to begin with. The recordings I knew well were like there were remastered (but in a good way) and the music got almost impossible to ignore as it did in some cases with other equipment, even way more expensive that the MP 11s. These are not amplifiers for the person that wants to play some music while they read or eat as background, they grab your attention by the collar and they move you to the rhythm so perfectly it is ridiculous. I have never encountered such a moving, fun and also with so much precise definition of the holographic images, amplifier at that price, close to that or much more to tell you the truth. Usually that kind of “super” (I like to call it) sound comes from way more expensive amplifiers that also have way more power reserves. And yet here it is. So amazed I was by the performance of the MP 11 that I invited many of my friends, fellow lovers of music first but good sound too, to check them out. These are some of the remarks: “If I have heard these amps I would never have bought my Devialet!”, “these amps are so much fun to listen to that it is a crime to be so affordable”, “they convey rhythm is such an addictive manner that is ridiculous” and so on and so forth. Their sound character is very easy to live with, they describe everything with precision but without sacrificing much in the wholeness of the music department (they do excel describing the individual instruments), but as I said it is impossible to ignore the sounds of music that comes through them, it is so enjoyable! 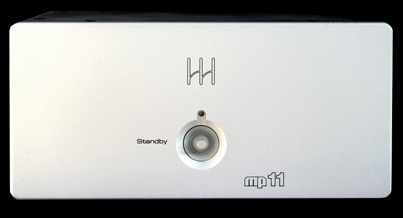 It is my definite belief that the MP11 is one of the best kept secrets of the recent years in High End and its sound quality and that is the main reason for that conclusion (its built quality falls into the middle of the price category it belongs, so no surprises there). I have to congratulate the Monrio team for that achievement, as it takes a lot of courage to create something that good and not as expensive as it should be if pricing was based solely on how they sound. The danger of “under-appreciation” is always lurking when you do that in this industry when it comes to price and performance. I hope that they get not only the respect they deserve but the recognition they deserve due to the very high sound quality they infuse into any demanding system. Check them out, you will be, too, surprised. And you will save a lot of money! And a short interview with Mr. Giovanni Gazzola, the mind behind the Monrio brand. You are the man behind the company. Can you tell us some details about yourself and how Monrio came to life? 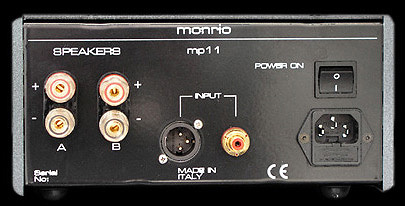 Before creating Monrio I was for 20 years, with the name Audio Team, the Italian distributor of famous high-end brands including: the first in Europe to distribute Martin-Logan, and then Spendor, Cambridge Audio, Quicksilver, Meitner, JPW , Fidelity Research, Voyd, Audio Innovarion, Cardas (the first to distribute Cardas outside the US), Clearaudio, Helius and others whose name I can no longer remember. On the basis of the experience acquired during the period in which I was distributor of those brands, I realized that it was possible to build devices with good musical performance without having to spend exaggerated sums. What kind of transistors do you use in the circuit of the MP 11, what is the basic circuit layout and how big is the power supply on each MP 11? 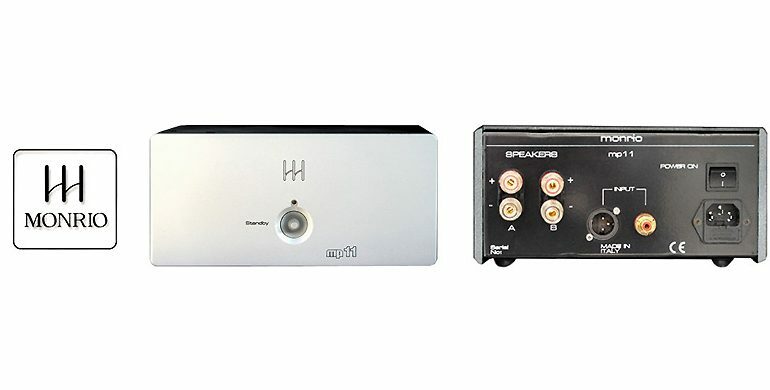 MP11 Mono block amplifier use selected and matched Hitachi MOSFET devices to give a maximum current rating of over 25 Amps per amp allowing high power delivery into even 2 ohm loads. Every mono block is equipped with its 300VA toroidal power transformer. The circuit design of the amplifier is fully complementary and balanced. No capacitors are used in the signal path, their use being limited to power supply decoupling and phase compensation. Since you mentioned it, yes I agree with you that the most important aspect of the MP 11 is its sonics. They are absolutely lovely, so much more than what somebody would expect from such an affordable amp. What was your goal during its design and evolution from just a thought to an actual product? During the design we had in mind the kind of sound we wanted to get. The project remained on the bench a long time and the prototype long listened step by step until we felt that the sound obtained was what we were looking for. Your company is in this business quite a long time now. What is that you learned during all that time of evolution about hi fi or high end for that matter? I learned that the good music and the pleasure of listening to it ended with the 90s. My opinion is that the CD has in some way destroyed the world of Hi-Fi and that all the technology that was later introduced with digital technology from the 2000s onwards it did nothing but drive the public away from the Hi-Fi world. The overpowering return of vinyl in recent times proves it. I’ve never seen so many turntable manufacturers at the Munich High End Show like this year. 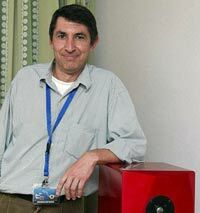 Does Monrio have other amplifiers with this kind of sound philosophy and can you tell us about them? All our products have more or less the same philosophy of sound. We always use our ears to make them. Practically the integrated MC206 is the one that comes closest to the MP11. It uses bipolar and non-MOSFET transistors but the sound resembles that of the MP11. I would assume that such a good amp should have a similar quality pre amplifier as a pair. Can you share some info about that? Yes. We are developing a new tube preamp to be paired with the MP11. I think it will be available immediately after the summer. What are Monrio’s plans for the near future? About a couple of year ago we introduced two models of turntables which, however, due to the long time lost for the MC206 and MC207 projects, we have not yet been able to define completely. Our goal is to complete these turntable projects and start to introduce them on the market. I hope these information will be useful to you.